Speculate aims to target stocks that tend to fly under the radar, perhaps due to the fact that they don’t suit the risk-averse investor, or simply because they are small emerging potentially next big thing stories where the market moving news is yet to break. FinFeed will be looking to uncover such stocks on a weekly basis. Contrarian investors or those looking to target stocks that are out of favour, often identify a particular sector that is exhibiting negative sentiment before sifting through companies that appear undervalued. 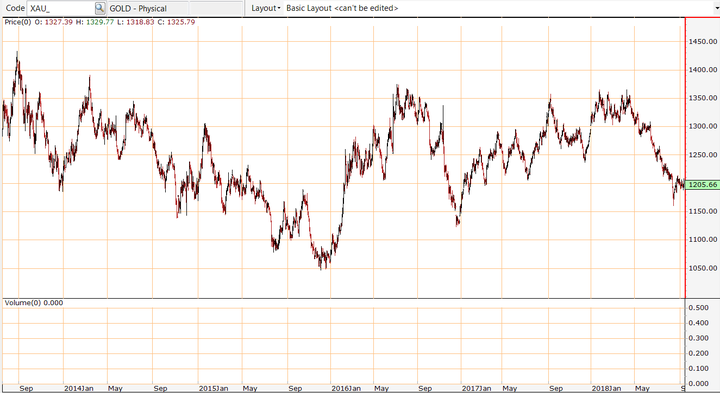 For those looking to adopt such a strategy, the gold sector could well be worth a look. Having fallen from about US$1360 per ounce in January to a 20 month low of approximately US$1170 per ounce in mid-August there is no doubting the fact that the precious metal is out of favour. However, there was a positive sign that emerged in August in that the price rebounded immediately to more than US$1200 per ounce, and it has hovered in that vicinity for the last three weeks. The following five-year snapshot shows that the gold price has traded in a range between approximately US$1050 and US$1400. Importantly though, it has rarely traded below US$1150 and when it has slipped to that level there has been a relatively quick and strong rebound. Examples of this can be between late October and early 2016, and more recently there was a two week period in December 2016 when the gold price fell below US$1150, but this was followed by a sustained recovery to US$1350. It just goes to show that commodity prices do fluctuate and caution should be applied to any investment decision and not be based on spot prices alone. One way to identify stocks with prospects, which all the same have been impacted by negative sector sentiment, is to compare their share price performances against the sector trend. 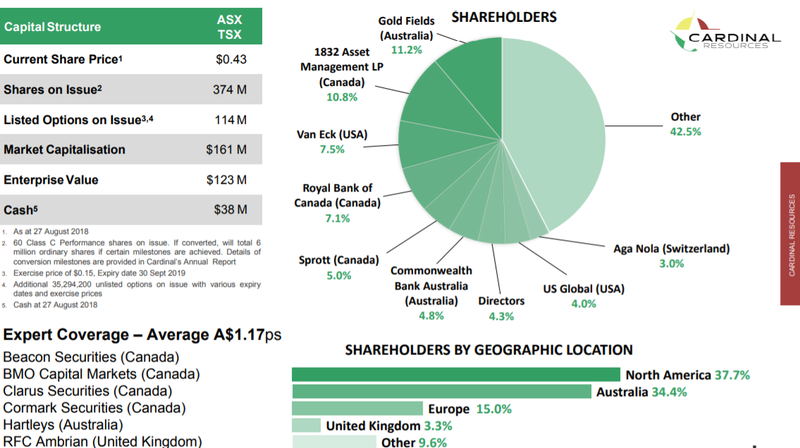 While it is difficult and often somewhat misleading to gather a data bank which takes into account all gold stocks, the S&P/ASX All Ordinaries Gold Index (XGD) is a good indicator as it is home to Australia’s largest gold companies. As indicated by the yellow line below, the index fell significantly in July/August in response to the downturn in the gold price. 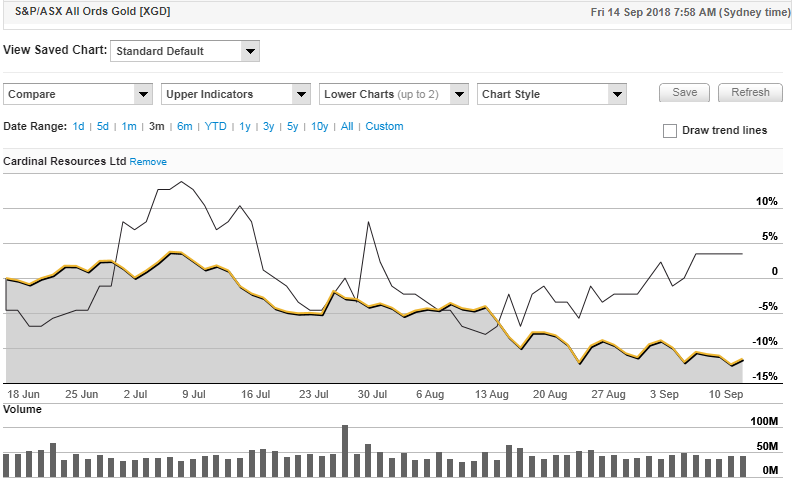 The stock I used as a point of comparison is Cardinal Resources (ASX:CDV), not a random pick, but because it is a company that I believe may be in the early stages of a significant rebound. Note the company’s performance over the last month where it has defied the broader sector trend, gaining ground and closing the gap between it and the sector trend line. 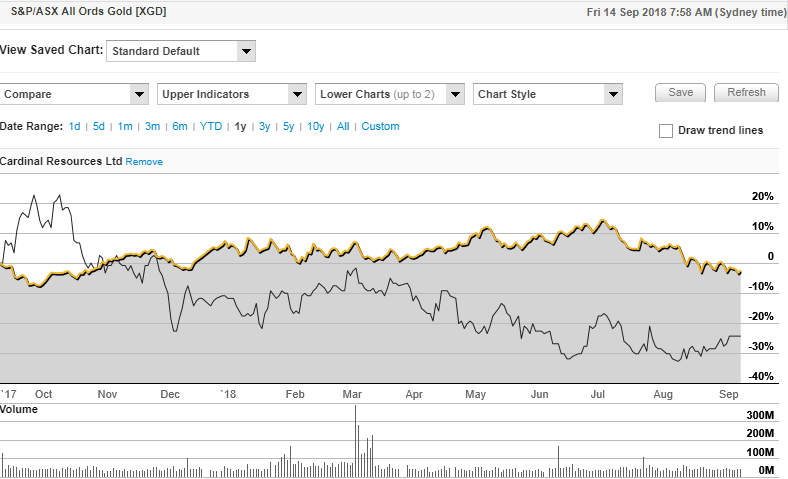 This trend is even more prominent in the following three month chart which shows a significant outperformance against the XGD. However, this stock has much more going for it than a positive chart trend, and it could be argued that the underlying reason for the outperformance is pending news regarding the company’s Namdini Gold Project in West Africa. This is in an excellent location in terms of being in proximity to some of the world’s largest gold discoveries and producing mines as indicated below. In what could be a substantial share price catalyst, Cardinal will release a prefeasibility study in the coming weeks. A preliminary economic assessment (PEA)/scoping study released in February 2018 incorporated upgraded resources and mining schedules, along with the latest metallurgical results and refined operating and capital costs. The PEA confirmed Namdini to be a technically and financially robust low‐cost mining opportunity, with potential to generate strong positive cashflows. The PEA evaluated three production throughput rates, 4.5, 7.0 and 9.5 million tonnes per annum (mtpa), all delivering strong returns. The preferred scale of development is to be selected following completion of the PFS which is scheduled to be released in September. In addition, consideration is being given to a phased approach to the development of Namdini, commencing with a 4.5mtpa throughput that would be designed for expansion to a higher throughput. The PEA indicated average annual gold production in a range between 159,000 ounces per annum and 330,000 ounces per annum. All in sustaining costs (AISC) are estimated to range between US$700 per ounce and US$800 per ounce, implying a margin of US$400 per ounce to US$500 per ounce at the current spot price. Potential mine lifes are as follows: 9.5 Mtpa -14 years, 7.0 Mtpa -19 years and 4.5 Mtpa - 27 years. 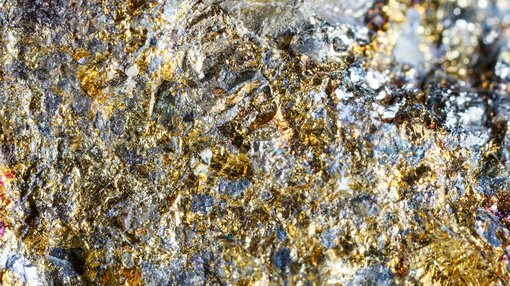 Hartleys’ resources analyst, Mike Millikan recently highlighted the fact that Namdini remains the largest undeveloped gold project in West Africa. He also pointed to the exploration upside of Ndongo East which lies 20 kilometres north of Namdini. In recent weeks Cardinal informed the market that it had intersected high grade shallow intersections from drilling at Ndongo. These included 2 metres at 27 g/t gold and 6 metres at 12.6 g/t gold. Commenting on this development and the possible implications in terms of the Namdini Project, Cardinal chief executive Archie Koimtsidis said, “These latest shallow, significant gold intersections have provided a possible three-fold extension to the original 400 metres strike length discovery zone to 1.2 kilometres in length. However, for the moment interest is centred on the upcoming Namdini PFS, as it could be a significant share price catalyst. Millikan’s projections point to maiden production of 341,000 ounces in fiscal 2021, generating a net profit of $118 million. His forecast is based on a gold price of US$1250 per ounce and the assumption that the company would opt for a 9.5mtpa production operation. It should be noted that broker projections are only estimates and may not be met. Those considering this stock should seek independent financial advice. 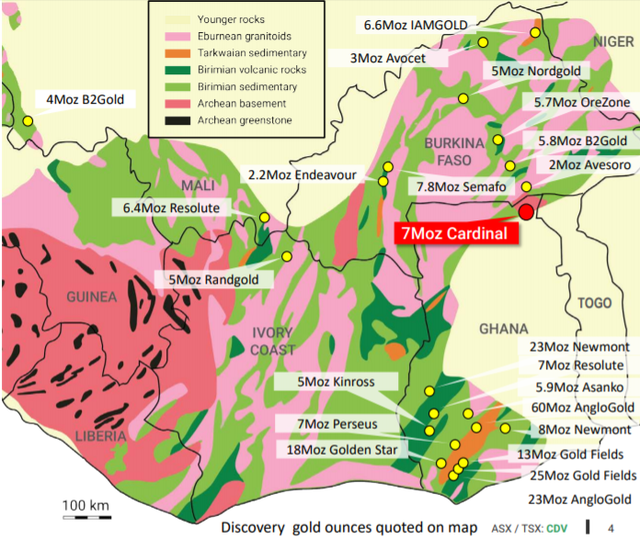 It is worth bearing in mind that Cardinal’s market capitalisation is only $170 million, seemingly undervalued should the company be able to demonstrate that it can progress towards annual gold production of circa 340,000 ounces. Perhaps a better guide as to the company’s prospects lies in the quality of its shareholder register as indicated below. Note the company’s strong cash position of $38 million as at August 27. While Cardinal would have to raise capital to develop a large project such as Namdini, it shouldn’t be too difficult to find support from its existing shareholder base. Millikan is of the view that the company would probably fund the project through a 60:40 mix of debt and equity. His valuation based on these metrics, which takes into account earnings per share dilution as a result of an equity raising, is 85 cents per share. Applying a discounted cash flow analysis and taking into account cash and future cash value, as well as the potential for value to be realised through exploration, he has attributed a 12 month price target of 95 cents. This implies share price upside of 50 cents per share relative to the company’s last closing price of 45 cents. Of course share prices are determined by market forces and implied values do not always translate into eventual values.